Now finding a taxi at your service is just one call away. Visit www.arenataxis.co.uk and check out the new and the best cab service in St. Albans. Call us now on 01727 844 844 and book your first ride. You will immediately feel the difference. We ensure a quality ride with the best price around. Visit the website or call us for more related details. Car boot sale ad details Find a taxi in St. Albans anytime, anywhere with the arena taxi for sale in London. 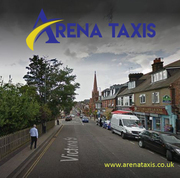 Find a taxi in St. Albans anytime, anywhere with the arena taxi available on car boot sale in London. More Travel tickets for sale in London and more second hand sale ads for free on 2lazy2boot - London car boot fairs - 37243.